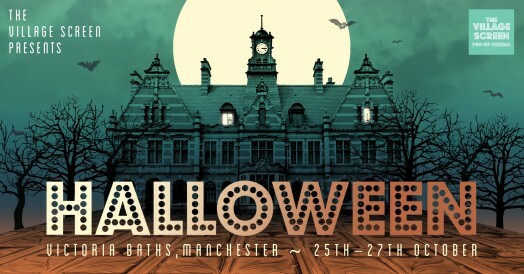 The Village Screen presents three film screenings at Victoria Baths for the ultimate Halloween experience! Saturday 27th October: THE WITCHES - family friendly classic (Doors 4.30pm with film screening at 6.30pm. The Witches is classified as PG and we recommend a minimum age of 8 to ensure a good view). Ahead of the screening, DJs will be spinning top Halloween classics alongside magical Halloween-theming (fancy dress is strongly encouraged). Some of the North's finest street food vendors will be serving up fantastic Autumnal grub and The Village Screen bar will be open serving a selection of Thornbridge beers, cocktails, wines, Prosecco, soft drinks and fresh popcorn. Full information about this and other Halloween film events at Victoria Baths can be found on The Village Screen's website HERE, alongside full Terms and Conditions.